GNU nano implements some features that Pico lacks, including colored text, regular expression search and replace, smooth scrolling, multiple buffers, rebindable key support, and undoing and redoing of edit changes. Pico (Pine composer) is a text editor for Unix and Unix-based computer systems. It is integrated with the Pine e-mail client, which was designed by the Office of Computing and Communications at the University of Washington. From the Pine FAQ: "Pine's message composition editor is also available as a separate stand-alone program, called PICO. PICO is a very simple and easy-to-use text editor offering paragraph justification, cut/paste, and a spelling checker...". Miyo is still Miyo...but there's a little more than meets the eye. Thanks darry1966. The 32 bit is finished. I hope to have the 64 bit finished soon...if all goes well. Sweet, I like what you did with the wallpaper! I like the flag icon too in the tray, what's it do? Thanks greenjeans. That means a lot coming from you. The flag is the keyboard layout switcher. Got sidetracked by a friend in Britain who asked me to make him a portable OS with a distro that shan't be named. LOL! Finished that up this evening, and then was able to put the finishing touches on the Miyo 64 bit (I hope). My goal is to have the new releases uploaded and available for users to download this weekend...either Saturday or Sunday. I'm in the process of testing the 64 bit version now. I can't say enough about fsmithred's work with the Refracta tools...I'm absolutely amazed and in awe every time I use them. The new MiyoLinux releases are ready if anyone is interested in trying them out. 1. PCManFM is controlling the desktop which allows for desktop icons and a few other benefits that may help people new to Openbox (this can easily be changed in the autostart file for a more classic Openbox experience). 2. The Update Notifier isn't installed, but it is available to be installed. 3. Added the jessie-backports repository, but it's not activated out of the box. 4. Added gxkb (a keyboard layout switcher). 5. Fixed that pesky Mouse wheel scrolling through desktops. 6. Added the ability to update icons in sub-menus. 8. Included a copy of the Obmenu-Generator .deb package. 9. DID NOT include a web browser. 10. Added much more wireless firmware. 11. Enabled Number Lock at system start-up (can be disabled in the autostart file). 12. Added a few "convenience" tools. More information regarding each one is given in the Release Notes. Other than those changes, Miyo is still Miyo. ...and many thanks to Devuan and fsmithred...and thanks to greenjeans for being such an inspiration. While allowing PCManFM to control the desktop does offer benefits, at the same time, it uses about 30 - 35 more MBs of RAM than just the normal Openbox desktop. So, if that is important to you (it is to me), then disable PCManFM's control over the desktop in the autostart file...and don't forget to enable nitrogen to handle your wallpapers. I consider greenjeans my brother-in-arms...and I am in no way competing with him. He'd blow me away if I were! fungus...you want to know what's strange? I've built some KDE Plasma desktops lately...very bare-bones but fully functional...and the resource usage is WAY less than you'd expect...we're talking less than Lubuntu. If Devuan ever attacks Plasma, I'd like to get my hands on it and Miyo it. With that said, I am currently working on a "Blind Squirrel" release though. After I mentioned that there should be a distro named "Blind Squirrel Linux" recently, I haven't been able to get it out of my mind...so I'm Miyoing it. Same Miyo as the most recent release, but it will offer users a few extra choices...that shan't be named until it's released. LOL! Thanks! But you have that backwards, there wouldn't be a Vuu-do if there wasn't a Miyo, i'm happy being number two as long as I don't have to try harder. and thanks to greenjeans for being such an inspiration. This also, you have backwards. gj, friend...you just don't realize how much of an inspiration you are. I can feel your excitement in your projects. As far as icons on the desktop...somebody had to do it. LOLOLOL! I saw it as just another way to hopefully get more people interested in Openbox. To me, it's the perfect DE...or lack thereof. So I'm not the only one who runs 32bit on 64bit systems? If you disable PCManFM's control over the desktop in the Autostart file, it will save you about +/- 30 MBs of RAM usage...just be sure to enable Nitrogen in the autostart file too so that it will handle the wallpapers. The upcoming secondary release will be available soon...I hope. Then users can choose from this most recent release or the new one. The new one is just something I'm doing for fun...'cause I'm stinkin' just that way. LOLOLOL! Unfortunately it didn't run. It booted ok and went to desktop, then I right clicked and that was it, like the previous edition. It may be some old hardware incompatibility. 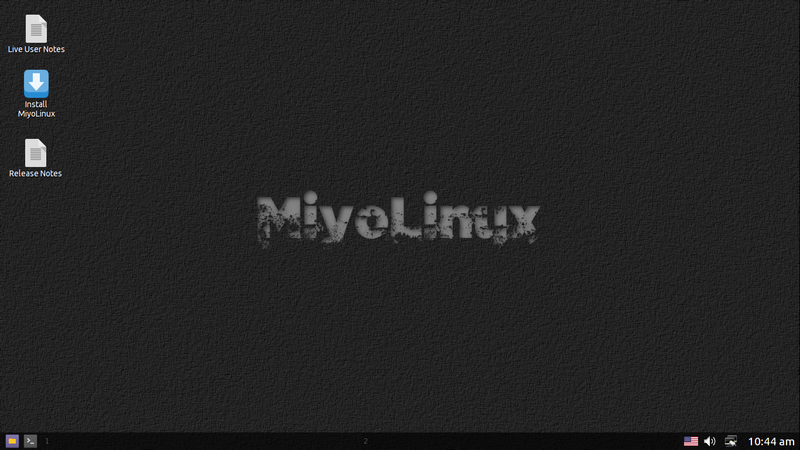 What I am going to try next is instal miyo into a usb stick and boot from that as a real non-live installation so then I can inspect the logs. Devuan Jessie and openbox/lightdm is already installed in the same machine by transforming a Debian wheezy into devuan jessie. Apart from being understandably slow with the desktop it works. You are not the only Miyo tester, there must be more among the hundreds downloading the image. If I didn't find it so amazing I would not bother testing it. 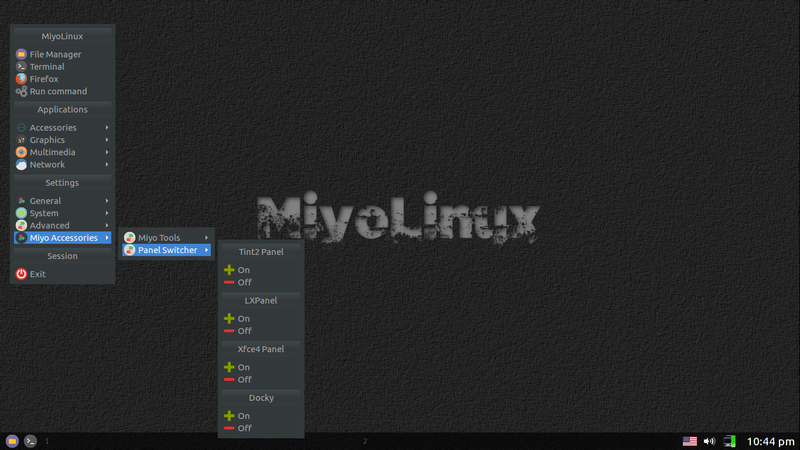 Plus my ascii installation in my work pc is Miyo with some additions. Aw man...sorry to hear that! I wonder how much the RAM may play a part? On my 32 bit machine, if I disable PCManFM from controlling the desktop (and enable Nitrogen for wallpapers), it boots up at around 85-90 MBs of RAM. Still, that can only happen AFTER booting into the desktop and changing it. I'm in the middle of testing my latest miyo-ostrosity. So far, everything is working great. I'm calling it Miyo-XTRA. No...there aren't any "extra" applications. Here's a screenshot of what the "extra" is. I wanted to include this in the latest release, but I figured I was pushing the envelope too far by including desktop icons. LOL! So, I've made this as a separate release.. Unless I find something wrong, I hope to upload them to Sourceforge within the next 24 hours. Docky is fun but I have gotten it to freeze up on me a couple of times (too many configuration changes all at once ?). Another low resource robust simple dock is plank. exist in plain devuan. But I haven't had much time to investigate much. I've never used Docky before (that I can recall). Unfortunately, it froze up with me too. I left the computer on over night, and when I got on it this morning, Docky was frozen. So...it wasn't an issue of too many configuration changes in my situation. Gonna scrap Docky for that reason and replace it with Plank. I have used Plank in the past and can't remember having any issues with it. 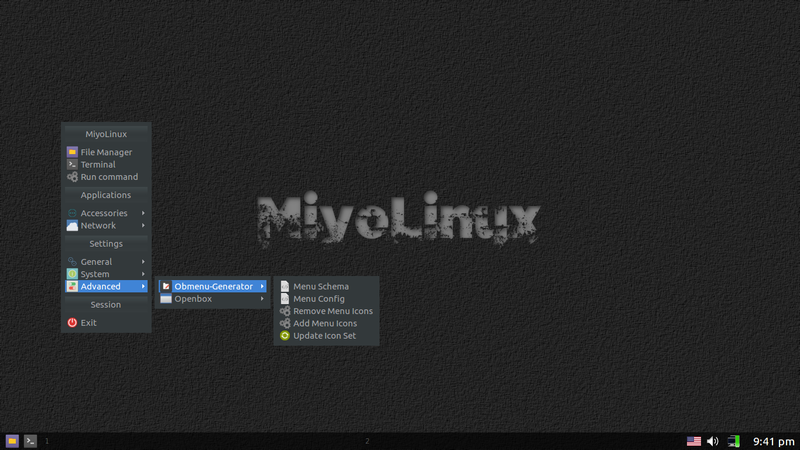 Okay...the Miyo-XTRA releases are uploaded to Sourceforge now. The only difference between the latest release of MiyoLinux and Miyo-XTRA is that XTRA has "extra" panels to choose from. No fancy GUI; it's all done through the menu. After all...it's Openbox! Why have multiple panels? Because sometimes it's just stinkin' fun to change things around. Okay, I think my work is done for now...I hope. Time to sit back, relax, and ponder all of the "I should've done this, or I should've done that". If I had a man-cave, I'd go there, but I don't have one. Geesh...I don't even have a man-grotto. LOL! I hope Miyo does well for anyone who tries it. Many thanks again to Devuan, fsmithred, and greenjeans. how d'ya get lxpanel without the rest of the desktop? Did you manually delete the rest of the stuff and left lxpanel and dependencies? Devuan openbox. If I log into lxde they work. But the list is there but even with complete sudo rights none can be mounted. Now even on lxde if I run sudo pcmanfm the list does not come up but if the user has mounted them then root has access in the /media/user/** mounted volumes. I know I had asked before and I am still researching this problem. eudev is now on all my installations but the problem pre-existed, it is not related. All the necessary gvfs tools are installed.